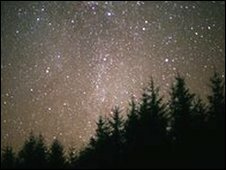 Most people feel their view of the night sky is spoiled by artificial light, a survey suggests. The Campaign to Protect Rural England (CPRE) is calling for more control on the likes of street lighting and neon signs to cut down on the problem. Its survey of 1,745 people in the UK conducted with the British Astronomical Association found 83% of people have been affected. About 50% of respondents also said their sleep has been disrupted. The CPRE says that light pollution wastes money, is damaging to the environment and seriously detracts from the beauty of the sky at night. It says comments from the survey ranged from sadness and regret to frustration and fury. Despite efforts to tackle the issue in recent years, campaigners say councils, businesses and householders must take steps to cut levels of light pollution. There are also calls for an introduction of planning guidance to ensure a long term solution. According to the campaign coalition, from 1993 to 2000 – the most up-to-date figures available – light pollution in England increased by a quarter and the amount of light-saturated night sky rose to 7%. It added that altogether councils spend £532m on street lighting each year and the lights can account for around 5 to 10% of a council’s carbon emissions.